Buddy Hield scores 26 points, Willie Cauley-Stein adds 17 points as the Kings record their first regular season sweep of the Spurs in franchise history. De’Aaron Fox’s crafty touch pass earns your Heads Up Play of the Day! 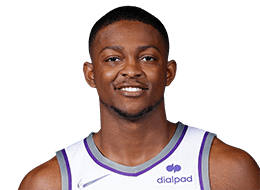 An early entry candidate, selected in the first round (5th overall) of the 2017 NBA Draft by the Sacramento Kings after his lone season at the University of Kentucky ... Signed to a multi-year contract with the Kings (7/7/17). Ninth consecutive NBA Draft the Kings selected an early entry candidate ... Highest drafted player by the Kings since 2012 (Thomas Robinson, 5th overall) ... Represents the Wildcats as their highest drafted player by the Sacramento Kings along with DeMarcus Cousins ... Marks the fourth time a Kentucky player has been drafted by the Kings in the first round (2010-Cousins, 2015-Willie Cauley-Stein, 2016-Skal Labissiere) … Became the highest drafted point guard by the Kings since 2009 (Tyreke Evans, 4th overall) ... In franchise history, the Kings have selected nine other players out of the University of Kentucky, the first being Bill Evans, selected in the fifth round of the 1955 NBA Draft. Averaged 11.8 ppg (.444 FG%), 2.3 rpg, 3.0 apg, 2.3 spg, 0.3 bpg and 21.3 mpg in four games played during the annual Las Vegas Summer League. As a freshman, averaged 16.7 ppg (.479 FG%, .246 3pt%, .736 FT%), 4.6 apg, 4.0 rpg, 1.5 spg and 29.6 mpg in 36 games (34 starts ) in his lone season with the 2016-17 Kentucky Wildcats … His assist average paced the SEC and was 11th best among freshmen nationally ... Named Third Team All-American by CBS Sports, USA Today, and ESPN, while receiving Honorable Mention by the AP ... Chosen All-SEC First Team and SEC All-Freshman Team by the AP and coaches ... Awarded MVP Honors for the SEC Tournament after averaging 22.0 ppg (.618 FG%, 3-5 3pt, .700 FT%), 2.7 apg, and 3.7 rebounds en route to UK's third consecutive crowning as 2017 SEC Tournament champions ... A NCAA Tournament All-South Region Team selection after he averaged 21.3 ppg (.500 FG%, .286 3pt%, .778 FT%) during Kentucky's Elite Eight run ... Set a school record for most assists in a college debut with 12 assists to go along with 12 points for his first double-double vs. Stephen F. Austin State (11/16/16) ... Posted the second triple-double in UK history after he recorded 14 points, 11 rebounds and 10 assists vs. Arizona State (11/28/16) ... Totaled 20 points and nine assists vs. UCLA (12/3/16) ... Notched his third double-double of the season with 24 points and 10 assists vs. North Carolina (12/17/16) ... Recorded 14 points in the final 4:36 of regulation, 16 total, in a win at Georgia (2/18/17) ... Scored 28 points in the SEC tournament seminfinals, the most by a UK freshman in SEC Tournament history, including nine straight points and 12 of the team's final 17 vs. Alabama (3/11/17) ... In the Sweet 16 scored a career-high 39 points, the most scored by a freshman in a NCAA tournament game as well as a 2017 tournament-high in a rematch vs. UCLA (3/24/17). Mother, Lorraine Harris-Fox, played basketball at Arkansas-Little Rock from 1986-88.